After enjoying a tremendous response from customers since its launch in July 2015 in Karachi, KAPRAY is set to launch 6 brand new stores, to the delight of fans nationwide. Expanding its retail operations to Hyderabad in a star studded launch ceremony on the 17th of December, KAPRAY awed all present with the detailing of the store interior as well as the newly revealed winter collection. The event was followed by the launch in Lahore on the 18th of December, hosted by the lovely Juggun Kazim with an unplugged performance by Noori. KAPRAY’S next destination will be Islamabad on the 20th, energized by a live concert at Centaurus Mall by the nation’s heartthrob, Uzair Jaswal. 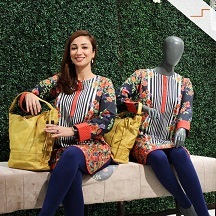 KAPRAY’S winter collection 2015, inspired by art and nature and translated by the edginess of digital pret, comes in unstitched components in varied, eclectic designs in a vibrant kaleidoscope of colors. Providing consumers with unparalleled style and value, KAPRAY caters to the entire household with stunning products ranging from KAPRAY Man, KAPRAY Woman, KAPRAY Kids to KAPRAY Home. Primarily a fast fashion retail brand, KAPRAY aims to provide the style conscious consumer with the latest fashion trends from international runways in record time. With a meticulous focus towards quality in all products, the brand is committed to bringing forth unique designs featuring its bold, urbane aesthetic with a dash of artistic whim.